Devoted Quilter: 100,000, Something New and a Surprise! Congrats on your 100,000th view!! You are so talented my friend, and I love that you are sharing your talents and your heart with us. Good luck with your "Bulletin"! (I just subscribed!) Can't wait for the first edition! Congratulations, Leanne! :) I love fresh cut flowers in the house, and I am lucky that roses grow outside in our yard so easily AND that my husband will frequently cut and arrange a vase of them for me. Good luck with the newsletter. It is nice to make dreams become real. I took some budding tulips to a friend of mine who is a wonderful 90+. When I spoke to her today she was telling me of the beautiful colors that they were opening into and how cheerful they were. Sometimes so little effort can create such happiness. Congratulations Leanne! 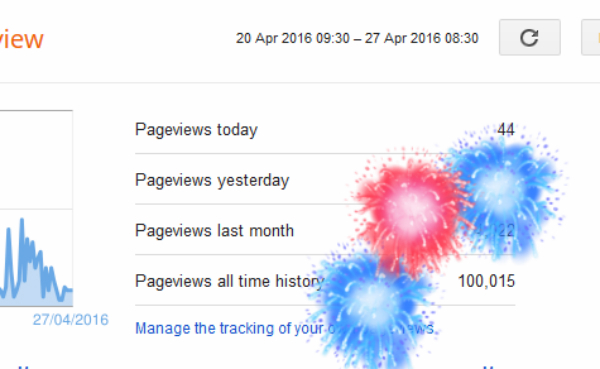 100,000 page views is an exciting milestone. I just recently hit it too but didn't have the forethought to create a gorgeous quilt as a giveaway surprise. Your quilting is just incredible! Congratulations too on your Devoted Quilter Bulletin! So much to celebrate in one post. I used to be so into gardening and would fall asleep on winter nights surrounded by gardening magazines and dreamt about flowers. I grew all my own plants from seeds under shop lights with full spectrum bulbs in the basement. My favorite plants are the ones which attract birds and butterflies. And hummingbird moths. Have you ever seen one of those? I think they might go as far north as Newfoundland. Their real name is the Sphinx moth, but they really do look like a hummingbird. They love Monarda (bee balm) flowers. Congratulations on reaching that milestone Leanne, it sounds like you have some exciting things planned for the future too. I have absolutely no green fingers so you can imagine how delighted I am that I have not one but two cacti in flower :) they are obviously hardy plants . 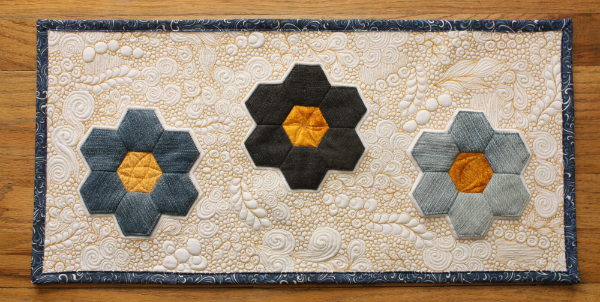 I adore hexies, could even say I am addicted to them, and your hexie flowers are divine. Thank you for the chance to win a piece of your lovely work. Congrats!!! Me and flowers...oh boy. I love flowers, they are so pretty, but too many and my allergies go crazy. My daughter makes fun of me because I can't seem to keep them alive. When she was in elementary school she had a project of growing a house plant she affectionately called "Fred." She kept a note beside Fred to remind herself what she needed to do. At the bottom of the note it said, "Please, mom, do not touch this plant." Congratulations Leeanne. When My husband and i were on our honeymoon , we were hiking the Bruce Trail in Ontario and I saw wild columbine for the first time. It's still my favourite flower and I have it growing in the front yard. I don't like the showier columbines as much as the delicate wild one. Congratulations!! I need to go look at my own stats. Your hexie project is amazing. I don't have a green thumb and don't garden. But I love flowers. I enjoy gerber daisies. My favorite flowers are tulips arranged in my grandmother's pewter jug. Always is a sign of spring for me.